Claudius is a man upset by Hamlet's play, and struggling to keep his emotions in check. He's not just enraged, but guilt-ridden as well, making for a scene with Rosencrantz & Guildenstern that's more emotional and intimate than most. Here, Rosencrantz's speech about the realm empathizing with its King becomes a way of consoling Claudius, and he even feigns(?) being moved, makes his voice tremble, etc. The sycophancy works and Rosencrantz gets a manly embrace from the King. Often painted as irrelevant cogs in the courtly machine, the R&G of this version seem to be in better graces, at least at the moment. This fits within its theme of Claudius preferring (and showing fatherly affection) to every young man BUT Hamlet, though he may simply be in a sort of daze, acting automatically. Indeed, when Polonius comes in, he gets no reaction. By the time the King breaks with his daydream and answers, Polonius has already rushed off. And then there is a sudden explosion of emotion, a sneeze as much as a sob, and though alone, Claudius still tries to maintain his facade. Patrick Stewart gives his lines a strong measure of sarcasm to make Claudius reject his own capacity to be forgiven, and this is something that's quite important to the Medieval point of view - the idea that the King is the voice of God, the head of the stately body and true origin of the realm's welfare. We've seen how this is true of Hamlet's Denmark, a weakened and corrupted country, and it's in his role as God of Denmark that Claudius rejects his own salvation. His damned state is of his own making, and at the very end, his final line is a full acceptance of his evil and damned state. It doesn't matter what he does to repent, his fate has been sealed, and so he may give in to evil since once damned is thrice damned. It's not that he rejects divinity, quite the opposite, it's that he sees himself as forever unworthy of divine grace. His later "sin will pluck on sin" is less an observation than justification for his wrong-doing. 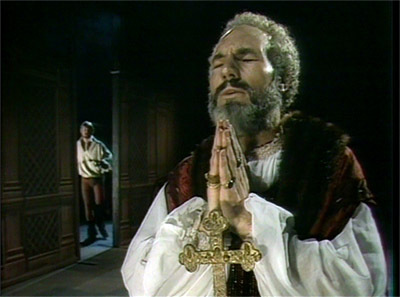 From his desk, Claudius forces himself to a small altar to pray, every move an effort, and Hamlet comes upon this scene by accident. 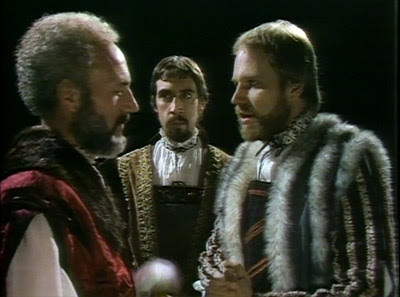 Unlike the close calls of other adaptations where Hamlet gets quite close to Claudius, here he never even crosses the threshold. The soliloquy is spoken directly to the camera, which gives Jacobi's Hamlet an opportunity to explain himself. It's the audience that doesn't understand this particular delay when Hamlet has just vowed to finally act, and he feels compelled to justify his non-action. It's no harder to reconcile than his apparent relish at describing the compromising positions he might catch the King in, including everything he hates about him, such as his "incestuous bed". Regardless of how it is played, the text itself is contradictory in this. Hamlet at once WANTS to catch his stepfather in bed with his mother, and then expressly FORBIDS his mother from sleeping with him. But that's Hamlet's own wretched state, balanced between putting a stop to Elsinore's evils and maintaining them to fuel his self-pity. He knows who he is now, but who will he be when it's all been said and done?